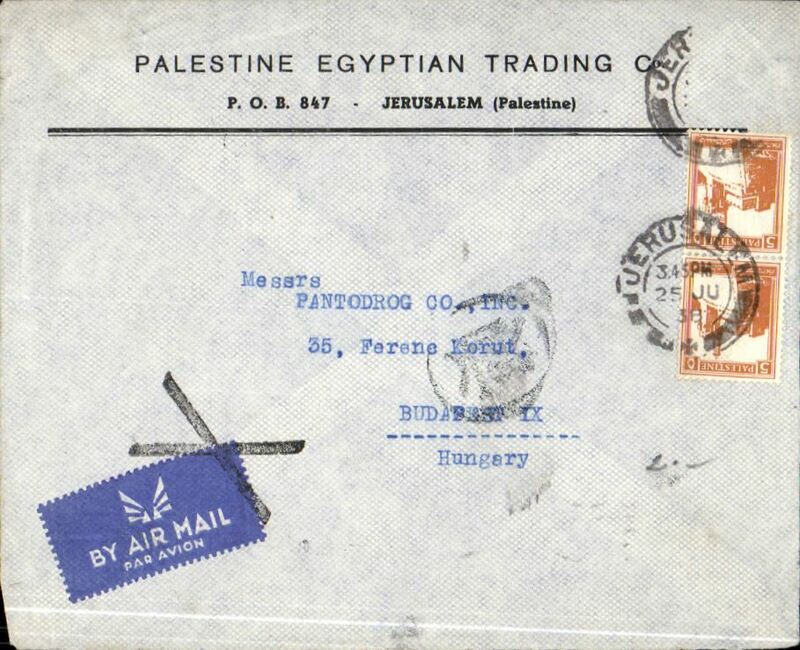 First acceptance of airmail from Palestine for carriage on the Imperial Airways first regular service from Croydon to Karachi, Gaza to Calcutta, bs 9/4, red/cream souvenir cover franked 20m. 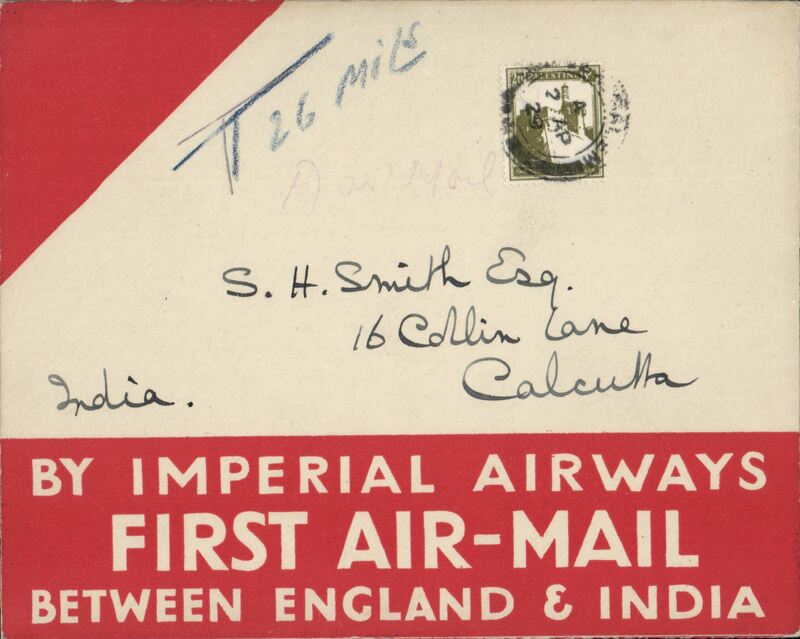 Flown F/F Gaza to Karachi then forwarded to Stephen Smith's home address in Calcutta, 9/4, to ensure safe receipt. Authenticated by original (not facsimile) signature of Stephen Smith. A fine item in pristine condition. Inward to Haifa, Quryat Haifa 29/11s arrival cds, from Strasbourg, via Paris Gare 23/11 and Paris RP Avion 23/11via Tananarive 23/7 and Tamatave 25/7, airmail etiquette cover correctly rated 1F75 postage and 4f air surcharge (2F per 10g). Written up on exhibition page with nice route and postage rate documentation. 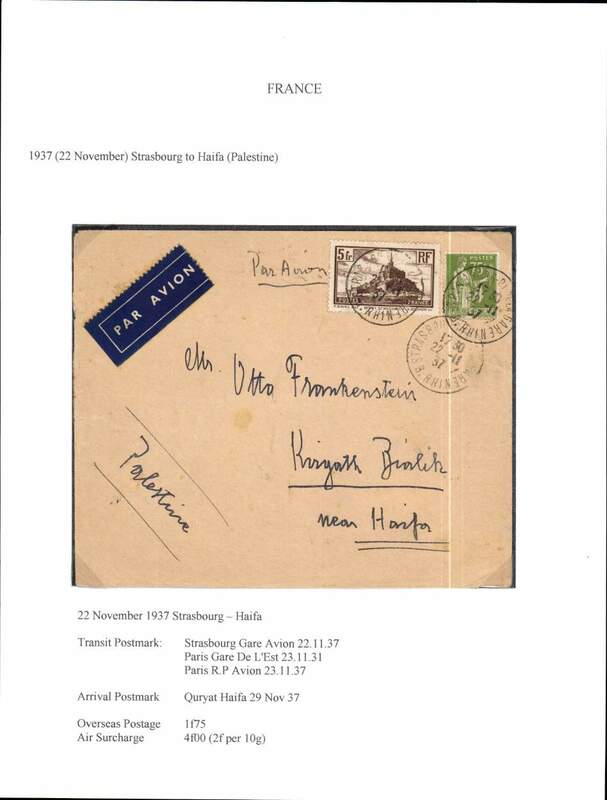 Jerusalem to Budapest, bs 2/7, via Athens 30/6, printed commercial cover franked 2x5P (a third stamp is missing) canc Jerusalem cds, black Greek currency control mark, airmail etiquette cancelled by black cross Jusqu'a applied in Budapest., flown all the way by air, most likely KLM, see McQueen p99. An interesting and unusual item in spite of missing stamp. 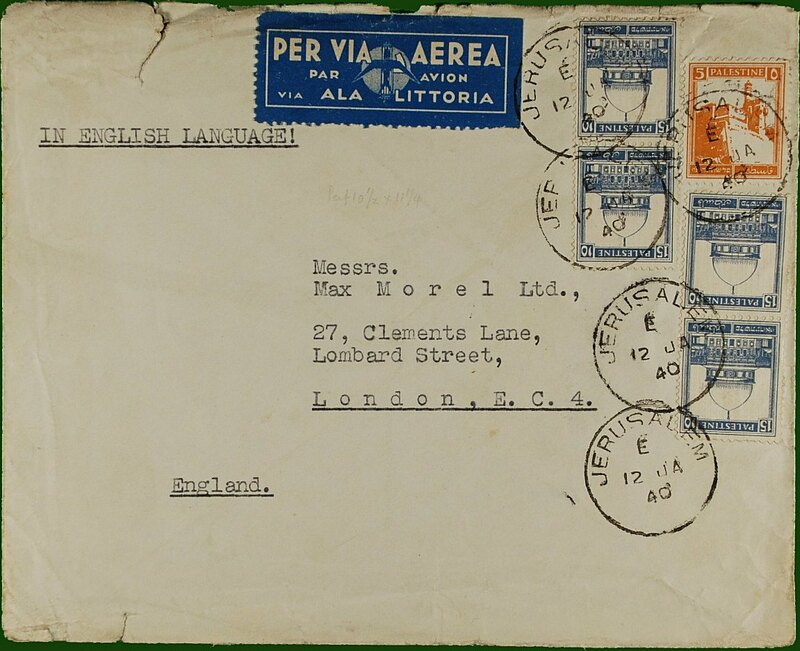 World War II uncensored air cover to London, no arrival ds, franked 65p canc Jerusalem cds which also ties a white/pale blue "Via Ala Littoria" etiquette with company winged logo (two perfs missing). Non invasive closed tear top edge. 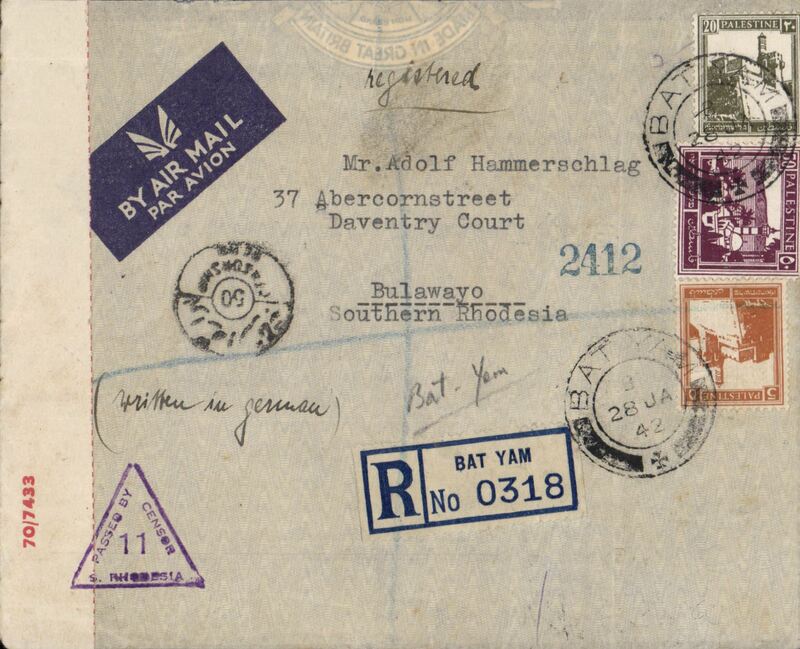 World War II triple censored cover, Bat Yam, Palestine to Bulawayo, Southern Rhodesia, bs 9/2, via Tel Aviv 29/1, and Salisbury 8/2, registered (label) imprint etiquette cover franked 75ml canc Bat Yam cds, ms 'Written in German', sealed Palestine red/white PC22 censor tape tied by violet Palestine five line censor mark verso and violet triangular 'Passed By Censor/11/S. Rhodesia' censor mark on front, also black Egyptian censor mark on front., Correctly rated 65c + 15c reg for carriage by BOAC, MISR or Sabena, see Boyle p551. An uncommon origin/destination with great routing. Image. 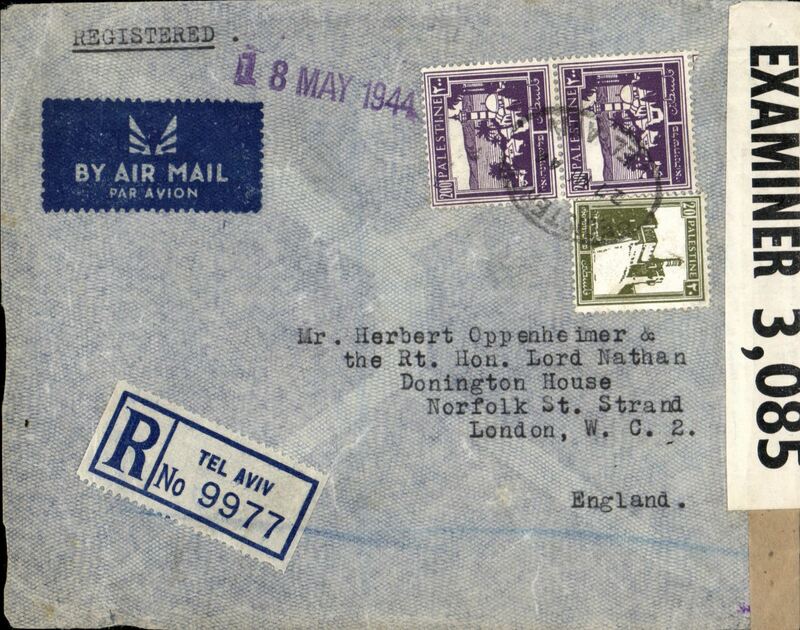 WWII censored high franking trans Africa/ two ocean cover Tel Aviv to London, 18 May 1944 arrival hs on front, via Miami 25/4 and New York 27/4, registered (label) airmail cover, franked 420ml, canc Tel Aviv oval ds, ms 'Written in Yiddish', sealed B&W Palestine OBE KK/38147 censor tape tied by violet framed Palestine censor mark. Carried .BOAC/Sabena to Lagos, Pan Am to Miami 25/4, censored en route at Bermuda where sealed PC90 OBE 3085 censor tape, US internal air service to New York 27/4, Pan Am FAM 18 to Lisbon, BOAC/KLM to London..A great WWII item with superb routing. 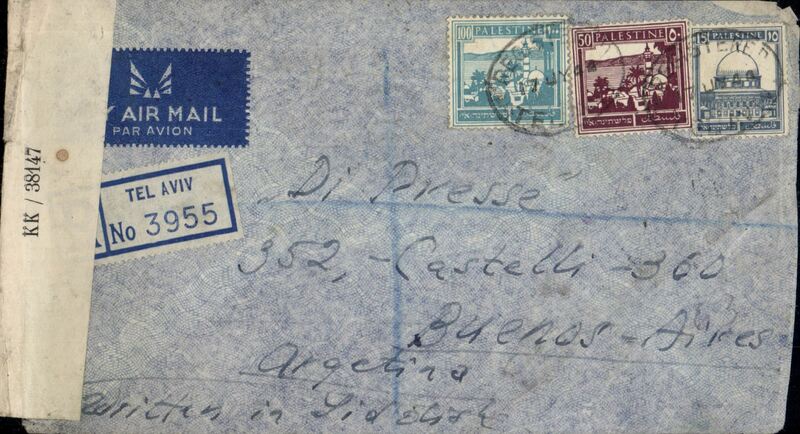 WWII censored Tel Aviv to Buenos Aires, BA Central PO 143 arrival hs, via Miami Aug 12 1944 transit cds, registered imprint etiquette airmail cover, franked 165ml, canc Tel Aviv oval ds, ms 'Written in Yiddish', sealed B&W Palestine OBE KK/38147 censor tape tied by violet framed Palestine censor mark. Correctly rated for carriage by Ala Littoria from Cairo to Lisbon, Pan Am FAM 18 to New York, US internal air service to Miami, then by Pan Am to destination. Good routing. 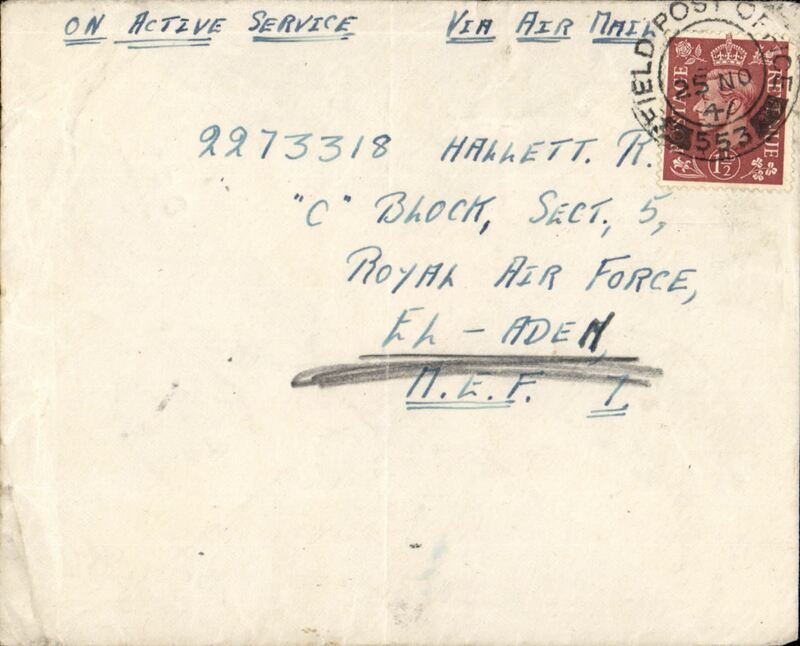 Airmail from British Forces in Palestine, plain cover franked 1 1/2d, fine strike 'FPO/553- postmark, ms 'On Active Service/Via Airmail' addressed to Royal Air Force El ADEM (in Libya, 15 miles S of Tobruk), but sent to Middle East Forces Aden in error, bs 9/12. It was then redirected to El Aden. Although the arrival ds reads 'RAF/23 DE 47/Aden, the 14 day redirection time. and the address being 'El Adem', strongly suggests this cover finally reached its intended destination. Likely flown on the BOAC Cairo-Aden service. A nice item with many interesting features and great routing.